With over 1,500 spacious acres, award-winning Broadlands, a master planned community in Ashburn, Virginia, is dedicated to preserving and enhancing the natural environment while combining a modern, active lifestyle. Broadlands planned community was created to accommodate 4,000 homes in balance with nature, and development is nearing completion. The National Wildlife Federation has named Broadlands a Certified Wildlife Habitat Community, only the 25th community in the nation to achieve this certification. Balancing the mix of streetscapes and neighborhoods with the sanctuary of nature seems to create a balance of life at Broadlands that is hard to beat. In the midst of modern living, this community has created a neighborhood based on older values. When you have a wildlife preserve running through the heart of the community that you care for, the land takes care of you. For active 21st-century lifestyles, Broadlands is a natural way to live. Amenities & Landmarks: The entire Broadlands community is spaciously designed to flow around Stream Valley Park, 150 acres of natural haven with wooden trails, wetlands and wildlife preserves providing recreation for people of all ages. In addition, many open spaces and areas like Hillside Park and Oak Tree Grove provide perfect areas for children to play for hours. At Broadlands, nature is not only a restorative backdrop for community activities, but is also a catalyst for bringing residents together, whether learning to build bluebird houses or participating in numerous post-certification activities protecting their Wildlife Habitat. 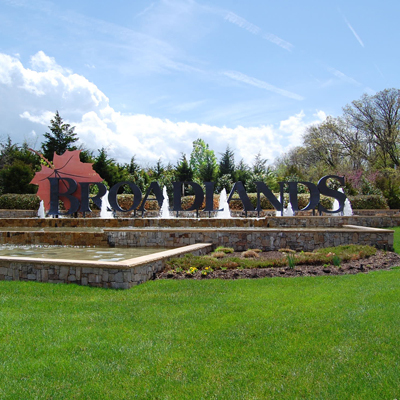 Broadlands residents recognize they live in a premier part of northern Virginia and take pride in their community through an active homeowners association, a wide array of natural and man-made amenities, and special events throughout the year, such as the Broadlands Live Concert Series. Reasonable HOA dues pay for upkeep of community common areas, playgrounds, nature trails and winding boardwalk, along with amenities such as three community swimming pools, tennis courts, and the stunning lodge-style 5,000 square foot Nature Center, the highlight of the community. Over 3 million square feet of shopping, restaurants, services, and offices are nearby at Broadlands Village Center and Broadlands Market Place. Education: School age children who attend public schools are part of Loudoun County Public Schools. Broadlands has two elementary schools (Hillside and Mill Run) and one middle school (Eagle Ridge). Students grow up together and attend the same high school nearby, Briar Woods High School, with continuity of friendships that last a lifetime. Getting Around: Broadlands is located in eastern Loudoun County, just off the Dulles Greenway at Claiborne Parkway (Exit 5), midway between Dulles International Airport and the town of Leesburg, Virginia. Located just 33 miles west of Washington, D.C., and only minutes away from Dulles International Airport. Broadlands is conveniently located just off the Dulles Greenway and minutes to Route 28, Route 50, Loudoun County Parkway, and Route 7. Ashburn will also be home to one stop on the new Silver Line Metro train system. Located between Ryan Road and Loudoun County Parkway off the Dulles Greenway, Silver Line Station Route 772 will provide a speedy commute through the Dulles Corridor to Washington Dulles International Airport, Reston, Tysons Corner, and downtown Washington, D.C.
History: The Broadlands community is managed by Broadlands Association, a homeowners association that incorporated in 1995. Broadlands became homeowner-controlled in 2009.